The Mad Barb is a stunning Asian carp species belonging to the Cyprinidae (carps) family of fishes and is found throughout its native habitat in Northern Malaysia, Thailand and Borneo. The Mad Barb is a mid-water to bottom dweller which swims in groups and is also known as the Mad Carp, Cigar Shark and Hoven’s Carp and in some instances the Sultan Fish. This carp species feeds on a variety of aquatic insects, invertebrates and plant matter and is found in freely flowing rivers and streams and seasonally on floodplains. 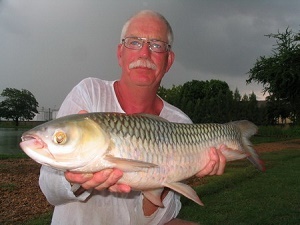 The Mad Barb or Hoven’s Carp in Thailand is a beautiful chub-like fish with a heavily scaled streamlined torpedo shaped body. The Mad Barb or Hoven’s Carp displays a dull silver to grey colouration throughout its flanks with a whitish underside and pink fins. The head of the Hoven’s Carp is very similar to that of the European Chub with a large slightly underslung mouth with small barbules located on each side. The Mad Barb is believed to be non migratory but certainly participates in trophic migrations locally to and from inundated forests and floodplains. This species especially favours a rich diet of parenchyma and seeds of the chaulmoogra tree which fall into the river. It has been reported that the Mad Barb appears to become intoxicated when feeding on the seeds and behaves in a peculiar manner. This Thai carp species is believed by the Laotian’s as being toxic and not fit for human consumption, however the Mad Barb is considered a delicacy amongst Vietnamese and Cambodians. The Mad Barb is a relatively rare visitor to the bank when fishing Thailand and can be caught on delicate float fishing tactics with small particle baits in addition to falling for a more conventional method feeder and groundbait approach.